Lesley Leighton, an established choral conductor and long-time singer with the Los Angeles Master Chorale who was appointed assistant conductor of the chorus a year ago, has been promoted to the newly-created post of Associate Conductor of the Los Angeles Master Chorale (LAMC) it was announced by LAMC Chair Mark Foster. Her three-year term begins July 2011 and continues through the 2013-14 Season. In this capacity Leighton will continue to work closely with the Chorale’s Music Director, Grant Gershon, to provide increased input on artistic programming and educational outreach projects, provide assistance at rehearsals and support Gershon’s leadership. In addition, during the 2011-12 Season, she will ascend the podium twice: on opening night, October 16, 2011, she will conduct Tarik O’Regan’s Tal vez tenemos tiempo, and on the season’s penultimate concert, “Andes to the Sea,” on April 29, 2012, she will also be featured. Leighton will conduct the Chorale in subsequent seasons as well. Leighton, a native Angeleno who attended Westchester High School, was appointed Assistant Conductor in July 2010 and will begin serving as Associate Conductor in July 2011. She sang with the LAMC from 1991 to 1997, before moving to New York City to continue her professional freelance music career and to serve as Director of Development for the Office of Mayor Michael Bloomberg. 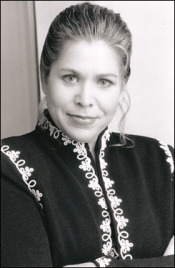 She rejoined the Los Angeles Master Chorale in 2007. Since 2008, Leighton has served as Artistic Director of the 100-voice Los Robles Master Chorale and its Consort Singers for which she also established, in 2010, its annual High School and College Choir Festival. In addition, she directs the newly established New West Symphony Chorus, which debuted in May 2011. Among other professional highlights, in June 2011, she prepped a choir for Beethoven’s Symphony No. 9 for the Japan Relief concert held at Disney Hall and has performed with some of the world's most eminent conductors, including Pierre Boulez, Zubin Mehta, Loren Maazel, Simon Rattle, and Esa-Pekka Salonen. Her opera credits include principal appearances with New York City Opera, Los Angeles Opera, Glimmerglass Opera, Köln Opera, and Glyndebourne. Leighton studied with LAMC Music Director Emeritus Paul Salamunovich at Loyola Marymount University, where she earned her BA in choral conducting. She obtained a Master of Music in vocal performance from the University of Southern California, where she is currently working on a Doctor of Musical Arts in choral music with her mentor and nationally recognized choral conductor, Jo-Michael Scheibe. The recipient of a two-year teaching assistantship from the Thornton School of Music at USC, Leighton was also honored in 2009 through the university's “Remarkable Women Awards” program in recognition of her "outstanding accomplishments and endless dedication" in the area of choral music.